It’s not a simple answer, and that’s likely what has led to the confusion. Product marketing teams can report to product (as it does at Samsung) while others sit in marketing (like it does at Apple). Some teams play more of an inbound or upstream role, owning the product roadmap, while others take an outbound or downstream role, taking the product to market. The best description I’ve seen of product marketing’s value to a business comes from Google. Simply put, it’s the job of product marketing to ‘Know the customer. Know the magic. 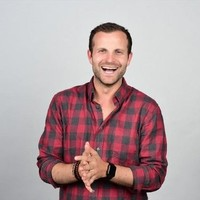 Connect the two.’ Unpacking and understanding the role of product marketing will help you leverage your product marketing team to accelerate growth. One of the most important roles that product marketing needs to play is to champion the voice of the customer into the business. They need to possess a deep understanding of what lives in the minds and hearts of customers, and be able to evangelize that insight across the business. This goes far beyond needs and pains but delves deep into their psyche to understand the emotional drivers of purchase and use. In this respect, the role of the product marketer is more akin to that of sociologist or psychologist than product manager or technologist. When I was in my role leading product marketing at Vidyard, one of the ways our team championed the voice of the customer was through a project to uncover the strategic, boardroom level problems we could help them solve. We interviewed our sales reps, sales engineers, and customer success teams. Hypotheses were tested and refined through dozens of deep-dive phone interviews with customers and non-customers. We validated and prioritized value drivers through an online survey to 500+ users. Sales resources were developed and training was facilitated across teams. The output of this project became the blueprint for how we communicated across marketing, had sales conversations, and priced our solution. Product management and development even latched on to the value driver outputs to help shape and prioritize the product roadmap. As an unbiased, third party (not sales or customer success), product marketing can drive win/loss analysis—a process aimed at deconstructing why we won or lost deals by conducting customer interviews and surveys. Buyers will often open up to product marketing in the spirit of improving pricing, messaging, value propositions, or the sales process. Product marketing identifies the group of customers that is the best fit for driving growth. This is brought to life through market research and real data about existing customers. I’ve always been a firm believer that product marketing is not an armchair quarterback role. Successful product marketers need to get close to the front lines to understand their audience and the changing market dynamics. Product marketing managers should spend at least 20% of their time interacting with their audience by joining sales calls, attending conferences, and interviewing customers. No team better understands the questions your customers are asking than your sales team. Spending time with sales will help build customer empathy and help you understand the feedback that is coming from the front lines. Knowing the magic is about possessing a deep, unmatched knowledge of the product. Product marketing is the product evangelist and cheerleader, inside and outside of the company. They are responsible for articulating why your product is different, better, special, and for how best to convey the value it adds in the customer’s own language. In the last few years, my wife and I have taken to puzzling. I’ve come to see that the process of solving a 1000 piece puzzle follows the same pattern to how I’ve always approached unlocking the value of a product. First, you need to flip over all the puzzle pieces and get them right side up. Then you start to group the edge pieces, the corners. Next, you sort the colors and finally, you start to put them together. Crafting the narrative for a product follows a similar path. Starting to assemble the puzzle before first flipping over the puzzle pieces will slow you down in the long run. The key to flipping over the puzzle pieces is close alignment to the product organization. I’ve always strived to align product marketing managers to product managers one-to-one on my teams. When product marketing teams has been most successful, product marketing managers and product managers are attached at the hip and working in concert. When we’ve been least successful, they are territorial, siloed or unclear on responsibilities. To build this strong working relationship, I aimed to sit with my counterpart on the product team at least two days a week and book weekly product marketing interlock meetings. The output of this well-oiled partnership was that product felt they had an ally in marketing who could help them communicate the value of what they’re building, and marketing felt they had a simple, cleanly packaged story to tell. Why did we build it this way? What other approaches did we try to solve this problem? What was the biggest problem we had to solve in reaching this point? Product marketing must understand the category, market dynamics, and trends that drive consumer behavior. This comes through from following the industry closely, including what’s happening upstream & downstream in the value chain. Product marketers gain this insight by reading industry materials, attending trade shows, and following influencers and analysts. Product marketing must be experts on the share-of-mind and share-of-wallet competitors and their relative standing in the eyes of consumers. This doesn’t stop at in-category competitors, but also competitors from adjacent or alternative ‘outsider’ brands that might fulfill similar needs. Connecting the two is where the rubber hits the road. Product marketing is the steward and caretaker of your narrative across the business. It rests on product marketing to shape a clear, compelling, consistent voice for the product in the market. More difficult still is ensuring that this story is well told and aligned across customer-facing touchpoints. When I started my career at BlackBerry, product marketing didn’t exist as a dedicated and well-established function. The need for what would become worldwide product marketing became clear one day when I walked into the office and found myself standing in front of three banners promoting the same smartphone. Each told a dramatically different story about what the product stood for and why consumers should buy it. Without standing for something, the product stood for nothing. It confused our channel partners, our enterprise sales reps and prospective buyers. Over the coming years, we built the worldwide product marketing function to help address this challenge, among a host of others, with the goal of crafting and telling a well-told story that connected a deep understanding of our customers and market with the magic of our products. Product marketing partners with sales enablement to define the content and support the delivery of training programs for sales and partners. Product marketing provides the fodder for the training content, while sales enablement determines how best to serve it up. This could take the form of demo scripts, competitive battle cards, sales collateral, pitch decks, and more. Product marketing works with go-to-market leaders like the Chief Revenue Officer, VP of Sales, and Chief Marketing Officer to define the go-to-market strategy and establish the connective tissue that aligns the target segments, value prop, routes to market, and marketing campaigns to drive demand. In this role, product marketing is serving as offensive coordinator, calling the plays and ensuring that every team is working towards the common goal. Demand generation teams rely on product marketing to help support demand campaigns by defining what experiences to highlight for which audiences and what language to use. Product marketing develops the briefs that drive the creation of website pages, marketing assets, including what experiences you should highlight, what screenshots to feature, and what language to use. Work with the creative director to bring the value proposition and the product’s magic moments to life through explainer and demo videos. Product marketing works with PR to write launch press releases, ensuring that the story is well represented, that the key differentiators are adequately highlighted and that the language will resonate with the market. At launch, PMM serves as a spokesperson for the company with media, doing demos and sharing the product and go-to-market strategy. Many technology companies struggle with executing flawless launches. 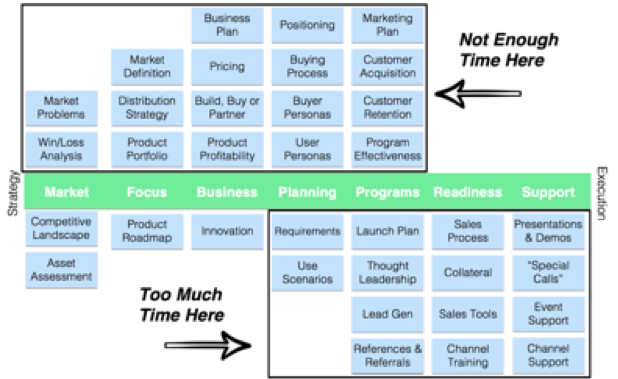 Products are ‘launched’ when code is ready, leaving marketing, sales, support, and customer success teams scrambling. Oftentimes, this is driven by no cross-functional launch coordination, a role that product marketing helps to fulfill. Product marketing owns the launch checklist ensuring that all go-to-market teams are at a state of ‘internal and market readiness’ before the product is launched. As experts on the customer, market, and product and with the ability to move fluidly between strategy and tactics, it’s customary for product marketing to get pulled in a lot of different directions. Product marketing often becomes a jack of all trades. Starting the product marketing team at one startup, I was attending events, delivering sales training, building collateral, joining sales calls and more. I was wearing a lot of hats and that gave me an opportunity to get to know the customer and the product even further. But soon, I found all these execution tasks standing in the way of tackling the strategic initiatives that would set the company up for growth over the next horizon. I was feeling more like a firefighter, responding to requests from sales, than providing strategic marketing leadership. When I work with product marketers and marketing leaders, I get them to do a time study of how much time in an average week they’re spending on various tasks. I’ll ask them to color code the chart below to represent the health of each activity. Green if it’s in great shape. Yellow if it’s done, but needs improvement. Red if it isn’t receiving much or any attention. It’s not uncommon to see a lot of red on the left with progressively more green towards the right. With a better understanding of which tasks are going overlooked, product marketers can work with their marketing leadership to carve off time to tackle the strategic deliverables that will fuel sustainable growth over the long term, and reduce the amount of time responding to fires. Do you have any best practices for product marketers you’d like to add? I’d love to keep the conversation going.